The Smart Growth community offers quick move-in options in Chesterfield, voted #1 Best Place to live in Burlington County. 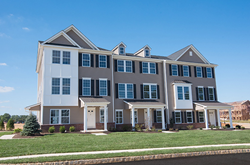 Only a few townhomes remain at Traditions at Chesterfield, an award-winning Smart Growth community in Chesterfield. All townhomes are available for quick move-in. Those interested are invited to schedule a tour and explore the Traditions at Chesterfield community, voted Community of the Year in 2016 by the National Association of Home Builders (NAHB). “This really is a great opportunity for those who are a looking to settle into a new home right away,” said Paul Csik, Senior Vice President for American Properties Realty, Inc*. “Traditions at Chesterfield also gives growing families the chance to be part of a great school district, exciting amenities and easy access to Routes 130, 206, I-95 and the NJ Turnpike. The Hamilton Marketplace and Shoppes at Hamilton are just 4.3 miles away and offers top notch shopping and dining options. The Carriage Collection of townhomes features three home designs to choose from with up to 2,698 sq. ft. of living space. Floor plans offer up to four bedrooms, three-and-a-half baths, recreation rooms, entry level walk-out or walk-in basements and one- to two-car garages. As an added benefit, townhomes have no homeowner association fees and are priced from the low $300s. Community highlights include neo-traditional homes in a charming village design with plenty of open space, including guaranteed preservation of land in the remainder of the township for years to come. Traditions at Chesterfield also features a new elementary school adjacent to centralized recreation facilities, as well as future retail. The New Jersey Turnpike, I-295 and Hamilton Train Station are all easily accessible to Traditions at Chesterfield for commuting to Philadelphia or New York City. Residents will find entertainment at nearby Six Flags Great Adventure and Mercer County Park and shopping at the Jackson Outlets. Chesterfield is also recognized for their top-rated, state-of-the-art elementary school (K-6), located within walking distance to Traditions at Chesterfield. Nearby Robbinsville also offers a myriad of dining and shopping options. American Properties Realty, Inc., a licensed real estate broker represents the principals who have been in business for over 40 years and involved in the development of over 10,000 single-family homes and townhomes, and is the sponsor of multi-family buildings. Headquartered in Iselin, NJ, American Properties Realty, Inc. represents Traditions at Chesterfield, LLC.